A good turnout for the Peterborough & DAA club match at Ferry Meadows saw the High Bank section in poor form. Roger Biddle took the honours with a modest 12lb 5oz, fishing the feeder and worm from peg 45. 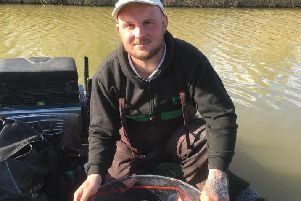 Runner-up was Nigel Briggs on peg 41 with 6lb 7oz, followed by Richard Linnell on peg 29 with one bream for 5lb 9oz. The Peterborough & DAA AGM takes place on Thursday April 6 at Fletton Ex-Servicemen’s Club starting at 7.30pm. Members should make sure they take their handbook along as it will be needed for voting. There was also a good turnout for the DeepingSt James match on their Horseshoe Lake venue at Wansford. It incorporated the last round in the Individual League Series and the Non-Winners Cup. Winner on the day and taking the Non Winners Cup was Brian Johnson with 16lb 11oz from peg 19. Second came Tony Johnson on peg 39, with 10lb 13oz and in third place was Graham Wright with 5lb 6oz. Individual League winner was Johnson with the best four out of five match score of 36 points. Second was Ray Torrington on 33 and third Nigel Collis on 30. There were some good nets of silvers taken in the Tuesday Club match at Stretton Lake. Out in front was Nigel Briggs with 10lb 14oz followed by Mel Saggers with a level 10lb.